With Everton struggling to compete financially with the majority of teams in the Premier League, Evertonians are becoming increasingly fragmented, with supporters allegiance to the board split between pro, anti and somewhere in the middle. With the debate heating up and the different camps releasing their own propaganda, I thought it was time that I delved into the financial statements of Everton Football Club Company Ltd to look at the clubs off the pitch performance during the last 16 years, the period in which Everton have been under the ownership of Bill Kenwright. In doing so, I am not looking to support any of the sides in the board debate; instead I am looking to present detailed facts to enable supporters to make up their own minds. The second part of the investigation looks at the financial performance of Everton Football Club, since the Bill Kenwright led consortium agreed to purchase Everton in 1999. Since the launch of the Premier League in 1992, English football has experienced a period of significant growth, especially in the top flight of the domestic game. Substantial increases in broadcasting revenue, merchandising and sponsorship, as well as soring ticket prices have resulted in unparalleled growth in turnover. The first graph details the growth in turnover experienced by Everton since 1999 in comparison to the clubs performance on the pitch. At a first glance, it would appear that Everton’s steady improvement on the football pitch has led to increased income generation and although that may be true to an extent (the periods of falling income coincide with a dip in the club’s league form) it would be wrong however not to delve a little deeper to look at the reasons behind the clubs increased turnover. This second graph breaks down the clubs turnover, focusing on three main income streams; TV revenue, gate receipts and other income. The dark blue area is the proportion of the clubs turnover generated through TV income. This has shown a fairly consistent year on year increase since 2001, however it should be recognised that Everton’s performance on the football pitch has little or no impact on at least half of the clubs TV income. Under the terms of the Premier League’s joint bargaining arrangements, 50% of the leagues total TV income is split equally amongst the 20 member clubs, 25% is divided based on the clubs finishing position in the league with the remaining 25% split based on the number of times the club appears live on TV. It would be fair to say that the increase in TV revenue is due to the success of the Premier League rather than specifically the performance of the Everton board. Due to the considerable increase in TV revenue, gate receipts are slowly playing a smaller role in the financial success of a football club. Despite significant increases over the 16 year period under review, Everton have recently noticed a slight decline in gate income. 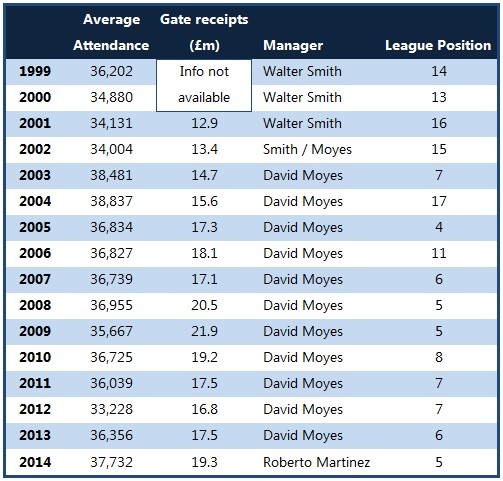 This was partly due to a lack of European football but also the gradual decrease in attendances in the latter years of the David Moyes era, however it is also a reflection of the clubs attempts to ensure the match day experience remains accessible to the younger generation, with low priced season tickets on offer. Other income, including sponsorship and merchandising etc is certainly a hot topic and probably the most difficult to accurately analyse. Some have accused Everton of underperforming in this area and I think there is certainly some truth to this. Traditionally Everton have lost money on merchandising and catering and therefore the club took a decision to contract these services out to a third party in exchange for a guaranteed profit. This has certainly seen Everton post a healthier financial return than they managed previously, however what this doesn’t account for is the rapid growth other Premier League clubs have experienced in these areas, particularly in the last 5 to 7 years. Let’s firstly look at sponsorship. The table below details the annual income each Premier League team receive in exchange for shirt sponsorship. Everton are pitched amongst the middle teams, which is where you would probably expect to find them, on par with Aston Villa, but due to the size of the clubs fan base, slightly below Newcastle United. It is Tottenham’s deal however, which should make Everton, Newcastle and Aston Villa appreciate what is achievable. The £16m a year deal is inflated by their London location but is a good indication of how successfully Spurs are promoting their brand. On this evidence it would be realistic for Everton to be at least achieving shirt sponsorship in the region of £10m a year. It is the Everton’s merchandise deal which has attracted the most criticism in recent months and there are certainly some performance issues associated with the contract, with a lack of availability and a lack of nationwide, never mind worldwide coverage. Everton’s deal with Kitbag, provides the club with £30m over a 10 year contract. This guaranteed income is more than the club were receiving from their previous deal with JJB Sports (£1.6m per year) but still sells the club short. In addition to the Kitbag deal, Everton receive an additional nominal sum from Umbro. A recent article published by the Liverpool Echo compared Everton’s merchandise record with Spurs and Aston Villa. Rather surprisingly Everton compared favourably against both these sides. Merchandising revenue at Tottenham rose 13% last year to £11m, which is still behind Everton’s. Aston Villa’s commercial income was up 12% (£2.8 million) from £22.9 million to £25.7 million, but again this figure should be split, comprising £9.4 million sponsorship and £16.3 commercial income, which is still better than Spurs and Everton. But Everton compare respectably with Spurs and Villa. I think a fair summery of Everton’s commercial success would be doing ok, but certainly an area for improvement and in fairness, despite public statements to the contrary, this is something the Everton hierarchy recognise. In assessing whether the Everton board are due any recognition for increasing the clubs turnover during the last 16 years it is probably wise to compare the clubs performance to other Premier League clubs. In 1998, the year prior to the True Blue Holdings takeover, there were nine teams in the Premier League who are also in the top division today. We have compared their turnover in 1998 compared to their turnover in 2014 and looked at the percentage increase each club has achieved in that time period. This table shows that Everton, rather surprisingly have increased their turnover four times over, which is a better performance than four other teams out of the nine clubs included in the list, including Manchester United. Everton’s total turnover in 2014 is also higher than Aston Villa and West Ham United, clubs who on average attendance alone can be considered equal to Everton in terms of size and in the case of West Ham they have the significant boost provided by the ‘London factor’. Of the clubs with a higher turnover than Everton, Arsenal, Chelsea and Manchester United have the considerable boost to revenue that the Champions League provides, while as Liverpool have a huge international supporter base. Tottenham, another club of a similar size and stature to Everton are a commercial success story, they maximise their London location to generate significant income through corporate hospitality, and sponsorship deals. It is often said in the business world that “turnover is vanity, profit is sanity”. This saying is certainly apt when looking at football finances. As income has boomed across the Premier League, so too have costs, especially wages and transfer fees. 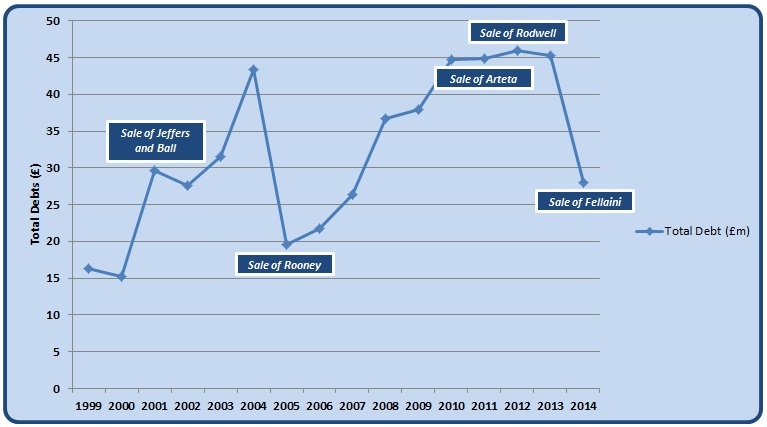 The following graph shows how Everton’s wage bill has increased since 1999. Surprisingly, despite this sharp rise, Everton has managed to maintain a cap, albeit a high one on wages, with the total wage bill never exceeding 80% of the clubs total turnover. Indeed, due to the recent boom in TV money, Everton’s wage bill in 2014 was below 60%, suggesting the club should now have considerably more disposable income than in recent years. Despite maintaining wages at a consistent level, Everton have rarely posted a profit during the period. Significant other operating costs and large loan repayments has left Everton posting a loss in all but two years during this period. In fact without successfully using the transfer market, Everton’s debt position would be significantly higher than currently stated in the clubs financial statements. In the following graph we have plotted Everton’s bottom line profit and loss position (light blue line). To look at how Everton’s losses would have been considerably higher without the clubs success in the transfer market, we have stripped out profit from player trading to plot an adjusted figure (dark blue line). To emphasise the point a little more, we have looked specifically at the line in the accounts which state the overall profit or loss on player trading. Now before you all jump the gun and say “where has the Arteta money gone”, it is important to clarify exactly how football clubs account for profit and loss on player trading. When a player signs for a football club, the total cost of the transfer fee is not charged immediately to the clubs financial profit and loss account. Instead the players transfer value is charged in stages, known as amortisation (a form of depreciation) and is based on the length of a player’s contract. As an example, we have looked at the transfer of Romelu Lukaku. The fee was reported at £28m on a 5 year contract. On completion of the deal Everton will immediately record the purchase on their balance sheet, adding an ‘intangible asset’ of £28m and decreasing ‘cash at the bank’ by £28m. The balance sheet does not however have a direct impact on the profit and loss recorded annually by Everton. Everton will then charge the £28m (total transfer fee) to the clubs profit and loss account over a 5 year period (length of the contract), therefore £28m divided by 5 years equals £5.6m per year. Each year the value of the player on the balance sheet would be decreasing by £5.6m. If the club were to sell Romelu Lukaku now (1 year after signing him from Chelsea) his current value would be recorded at £22.4m. If Lukaku was transferred to Manchester United for £30m, Everton would record a profit on player trading of £7.6m and not the £2m increase on the fee they paid Chelsea. These figures prove what a number of supporters and commentators have been saying for some time. Everton have needed to sell players in order to generate funds for new players and to maintain financial stability with the bank. In is widely thought that without the sale of Wayne Rooney to Manchester United in 2004, Everton could have been looking at administration and life away from the Premier League. If the profit and loss statement can be misleading, so too can the clubs balance sheet. As we have seen from the profit figures, Everton are not a club who generate significant funds for the club to invest in the transfer market. If the Everton manager wishes to invest in new players, the club have had to borrow to facilitate this, or they have had to sell players to generate funds. The graph below details the clubs annual debt level, which since 1999 have steadily increased, in fact if it wasn’t for the sale of players, the clubs debt levels would have been considerably higher than they are today. Everton have two significant loans. In 2002 the club borrowed £30m, this was secured against future season ticket sales in a deal which can be compared to a typical mortgage deal you or I may enter into when purchasing property. In this instance the bank was willing to loan money to Everton, happy in the knowledge that the payments would be manageable considering the clubs loyal supporter base. This loan was secured over a 25 year period and will be cleared in 2027. This type of facility is very common across Premier League teams. The second loan is taken annually and is secured against the clubs guaranteed Premier League broadcasting revenue; this type of arrangement is very similar to a pay day loan (but with a much lower interest rate). The loan is cleared each August, with new terms agreed annually for a new loan based on the projected financial needs of the club over the following twelve months. As long as the club retains its Premier League status, this facility is likely to be made available to the club on an on-going basis. In 2014 this loan totalled £20.9m. Following the sale of Marouane Fellaini in August 2013, the club were for the first time in quite a while, in a cash rich position. This injection of cash reduced the clubs net debt down to £28m. I would anticipate that in the 2015 financial results (released in October 2015) the clubs debt will be back close to the £45m figure seen previously, this is primarily because the club invested significantly in the purchase of Romelu Lukaku from Chelsea for a club record £28m. It is difficult to measure a football clubs susceptibility to debt. For a traditional business, debt is normally measured against the assets it holds on the balance sheet. This is a difficult exercise to complete for a football clubs as the assets on the balance sheet are not a true reflection of their market value. A football club’s main assets are its players, however only players the club purchases are included as an asset, and even then, only at a marked down value based on their actual transfer fee and the length of the original contract. To highlight this we have looked at some of Everton’s highest profile player and compared their value on the balance sheet compared to their market value. If Everton decided to make Ross Barkley available for transfer, he would probably attract a fee of between £20m-£30m. However as Ross came through Everton’s academy system his value on the balance sheet is £0. John Stones was purchased by Everton for £3m on a 5 and a half year contract in January 2013. His value on the 2014 balance sheet would have been recorded as approximately £2.5m. His current market value, approximately £34m. Seamus Coleman was purchased by Everton for £60,000 on an initial 3 year contract in 2009. Although he has signed further contracts since, these play no part in his balance sheet valuation. His value on the 2014 balance sheet £0, his market value £20m. Therefore the only true comparable is to look at Premier League clubs of a similar size and stature to Everton. This is in itself a contentious issue so we have picked a handful of clubs to compare Everton’s debt levels against. Certainly in comparison to other Premier League teams, Everton’s debt levels are low. We have looked at the current debt of each midlevel Premier League team. Swansea and Tottenham are the only clubs able to report a zero level of debt, with other clubs reporting significantly higher debt levels. Let’s not forget that Aston Villa, Liverpool, Newcastle United, Southampton, Stoke and Sunderland all have billionaire owners, yet despite this, report significant levels of debt on their balance sheet. In summary there is a considerable amount of data available to analyse and assess the success of Everton off the pitch. This is hard statistical data, presented as part of the overarching company’s financial statements. This is information that is presented in accordance with UK accounting standards and is reliable, factual information. So what are the conclusions we have drawn from our analysis of the last 16 years. Everton have experienced a period of financial growth unparalleled in the clubs history, however much of this credit must go the success of the Premier League and not the board of Everton Football Club. Huge increases in TV revenue has seen Everton’s turnover rocket and this is set to grow still further with a new record broadcasting deal taking affect from the 2016-17 season. Commercially Everton have not been as successful as their peers, with Tottenham Hotspur in particular highlighting what is possible. It comparing Everton to Spurs, it is important to recognise the ‘London factor’, however the White Hart Lane board have taken advantage of the Premier Leagues success to promote their brand worldwide, attracting huge sponsorship deals that Everton could only dream of. In terms of the clubs wage bill, Everton have managed this successfully, pushing the clubs resources to the limit to ensure they have been able to compete at the top end of the Premier League table. Everton have never been the biggest payers, with many clubs who have consistently finished below Everton paying considerably more, however Everton have signed well and they have utilised the youth academy to maintain a strong squad. Everton’s debt levels are certainly not high in comparison to many of their Premier League rivals. At times Everton have stretched their finances further than the bank felt comfortable and as a result have been forced to sell players to satisfy the financiers. The loan secured against season ticket sales is very common amongst football clubs, it is the ‘payday loan’ that causes the most concern, however Everton, with the increased broadcasting revenue, may no longer need to rely on this type of facility. Despite the nature of the clubs debt, the board should receive some credit for exploring every possible avenue to ensure Everton were able to compete in the transfer market. The ‘payday loan’ was first taken by the club when David Moyes felt he had taken Everton as far as he could without further considerable investment. Without new owners, the only way the board were able to finance a move into the transfer market (the then club record move for Marouane Fellaini), was through the acquisition of further debt. This all boils down to the fact that under the current board Everton are a club struggling to, but just about managing to live within its means. The club very rarely reports a profit, but any losses are relatively small, or in the past have been subsidised via the sale of a major player. Hopefully this will change under the terms of the new television deal, but the early indications are that Everton will still struggle to compete financially with the Premier Leagues billionaire owners. Due to the level of interest in the first part of this investigation and the subsequent questions our readers have raised, I have decided to extend the scope of the investigation to look at the failed ground moves and the impact of the various chief executive officers who have been in place during the Kenwright era. To ensure these areas are looked into in sufficient detail, parts 3 and 4 will be published during the next few weeks. Great articles; balanced and factual . Kenwright is an honest man and I firmly believe that if indeed he has stopped takeovers it’s been in our best interests (at least he’s genuinely believed that). Can I pose a question? Could the ‘real’ Evertonians on the board make their shares available (up to 51%) of the total shares, sell to season ticket holders, with all monies raised to clear any debt (the season ticket mortgage) and go to transfer funds. Happy for them to take an inflation proof profit on their initial investment but this would secure evertonian ownership, true peoples club status and be a truly altruistic gesture for the good of the club. Far fetched? A great idea. There are Everton supporters overseas who would be glad to pitch in, as well. Fantastic piece of work. Well done! Stopped reading after you made the same mistake i pulled the echo up over. You write that everton receive £30m over 10 years fron kitbag, which is £3m a year and you continue to write that it compares favourably against tottenhams which is £11m a year. I read it as Spurs having lower percentage increase not value during the period but the article does also acknowledge that we should be looking at similar to Spurs re £11m pa and not £3m. I guess taking the situation from being a loss, to 1.6m to now £3m per annum guaranteed is something of a success albeit maybe selling ourselves short with hindsight. Having read the Everton accounts over numerous years I concur with your findings and great articles. Working in Wealth Management for many years, there are not billionaires queuing up to buy clubs and for me I believe we should seriously consider either a new share issue and truly become the people’s club. Could we sell to fans 500,000 class X shares at £100 to fans/shareholders? How can they have lower percentage increase when evertons has been the same money since 09? Also says villas £25.7m is better than spurs 41.8m, how? Then says everton compare respectably, you do know everton get £12.7m right? Shirt sponsor information aside another great piece. Ballanced views for a change. It does however lead me to believe that as a club we are waiting to clear and then refinance the payday loan to secure transfer targets this summer. In which case explains why we are dithering and missing out. Or it will be a player sale that funds New acquisitions. Thus ending the short term loan for good as next year increased broadcasting revenue will cover this. Either way we can expect a future transfer budget not to exceed circa 20 mil without player sales. the mismanagement of the kings dock fiasco unable to raise 30m for one of the opputunities of a lifetime for efc shows the financial failings of the present board.